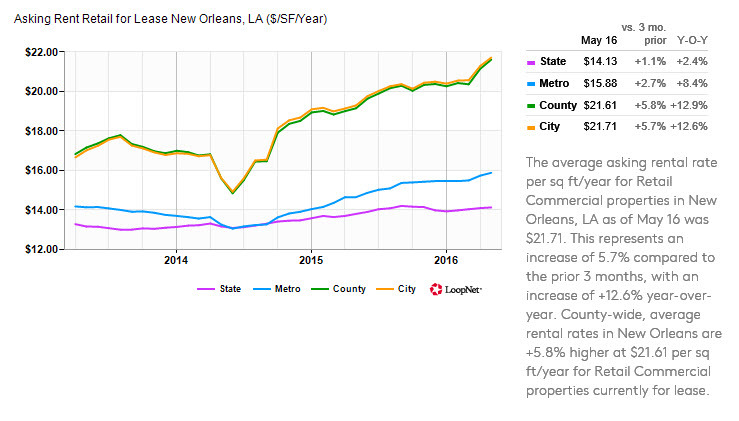 With a 77% increase in price, the gold medal for New Orleans’ commercial real estate goes to the apartment sector, far outpacing every other sector of commercial real estate over the past year. The silver medal goes to the office sector with a 21% increase in average sale price, and the bronze goes to the industrial lease sector with an 18% increase in price. Sale Prices: Statewide, sale prices are lower than in New Orleans, but are experiencing a higher growth rate over the past year. In New Orleans, asking prices for industrial property average $61.93 per square foot, up 8.1% from one year ago, compared to an average price over the state of only $51.65 per square foot, but up 9.7% compared to one year ago. The New Orleans industrial market is highly fragmented with Elmwood commanding the highest prices and New Orleans East bringing the lowest at around $20 per square foot. Lease Prices: Asking prices have increased 18.4% over the past year for leasing industrial property in New Orleans ($7.09 PSF), compared to a 3.5% increase in the New Orleans-Metairie-Kenner metropolitan area ($6.65 PSF). Statewide saw a decline of almost 1% but commanded the highest lease rate averaging $7.13 PSF. 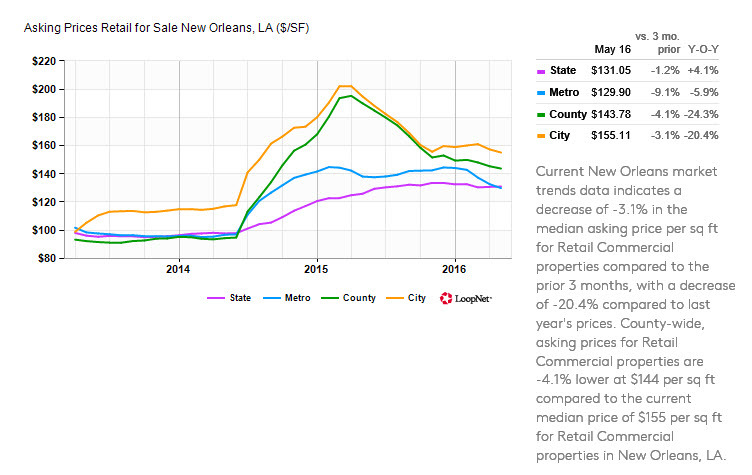 Sale Prices: Retail prices in Louisiana, Orleans Parish and New Orleans were flat during 2013-2014, then only New Orleans’ prices rallied hard from 70% to 100%, then peaked in March 2015 and have retrenched 30% to where most retail property is priced around $140 per square foot. Louisiana prices averaged an increase of 4.1% while New Orleans sale prices are up 20.4% over the past year. Lease Prices: New Orleans retail lease prices experienced a 12% increase over the past year, averaging $21 per square foot, compared to only a 2.4% increase statewide, averaging a price of $14.13 per square foot. Sale Prices: New Orleans Office sale prices exploded over the past year, increasing 21.3% and averaging $147.81 per square foot, compared to the Louisiana office sale price increase of 5.4%, averaging $103 per square foot. 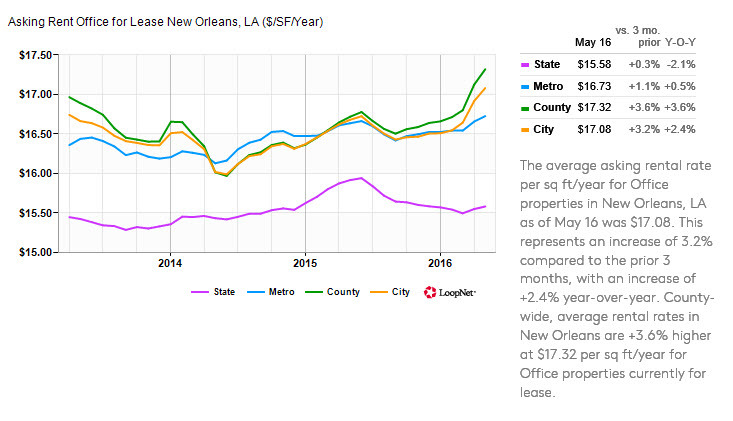 Lease Prices: New Orleans office lease prices have increased only 2.4% over the past year, averaging $17.08 per square foot, compared to the state average decrease of 2.1%, averaging a price of $15.58 per square foot. Sale Prices: With an average 77% increase in price over the past year, apartments experienced the strongest growth. The New Orleans apartment average asking price per unit increased from $60,000 in the summer of 2013 to over $125,000 per unit today. New Orleans has a stronger market than the state does in four sectors: apartment sales, office sales and leasing, and retail leasing; however, the charts in every sector show prices can fluctuate both up and down wildly, and remember: past performance is no guarantee of future results.